Editor Note: Our latest staff review comes from staffer Arwen. As a word of warning, Arwen’s review has SPOILERS from the very beginning. If you are avoiding spoilers of any type, please know — you have been warned! I am a Tolkien fan, and a fan of filmed entertainment. As such, here’s my take on The Hobbit: The Desolation of Smaug. If you are going in expecting a verbatim rendition of what you read in the Hobbit book, you may be upset or even disappointed. If you are going in expecting an entertaining experience inspired by J.R.R. Tolkien’s work, you are in for a treat. What Peter Jackson and his team have done with this movie is say to us: “we love this book and Tolkien’s ideas, now let us show you how we think we can expand the material and transform it to a memorable movie experience”. I really liked The Hobbit Film 1. But I must admit that it felt a bit long at times. I never had this feeling with The Hobbit Film 2. It constantly moves forward. There is great pacing, nothing is rushed but at the same time nothing is slow, with the necessary breathers at the right spots. I generally do not consider myself a “book purist”. I recognize filmed entertainment as a different medium. I don’t expect a movie to convey stories and emotions the same way than a book can. In Film 2 of his Hobbit trilogy, Peter Jackson felt he had the liberty to “stretch his legs” a little and at times stray from the written page and create his own stories. I am open to this approach as long as it moves the story forward and remains true to the original themes of the material. I think the film totally succeeds in doing that. Of course some fans of the book may feel that the filmmakers took great liberties with the material that was given to them. At the same time, these liberties can also be looked upon as “expansions, ideas” inspired by it. Personally, I find The Hobbit book a bit generic in descriptions, characterizations, and plots (the first targeted readers being children). In this film adaptation, PJ and his team have let their imagination run with the material. The first half of the film comes pretty much straight from the book. Beorn, Mirkwood, Thranduil’s halls. I loved the whole Beorn’s sequence, Beorn’s look, his voice characterization. I appreciated the little touches from the book (the bumblebees). Mirkwood’s depiction is fantastic, the disorientation of the dwarves, Bilbo’s daze, his going up the trees to breathe, the butterflies, and then the spiders’ entrapment and ensuing fight. The LOTR and Hobbit movies so far have never had speaking animals, yet for Film 2 the filmmakers have managed to make it a logical part of the storytelling: the spiders’ talk seems to be launched from Bilbo being in the “shadow world” (another nice touch, we even hear the spiders say “Attercop”). The capture by the Woodland elves, Thranduil’s interrogation of Thorin, and then the dwarves’ escape are all fantastic. The barrels sequence is a spectacular, fun action piece, something Peter Jackson excels at. Having reached this point in the film, the filmmakers decided to expand on what’s written on Tolkien’s page. I really liked how some of the book’s characters were further developed. Take Bard: instead of appearing suddenly out of the blue like he does in the book – the film version makes him a smuggler, a troublemaker who’s under suspicion and surveillance, a family man who’s trying to keep his loved ones safe. Similarly the Master of Lake-town becomes a politician who’s ready to embrace anything that may serve his own interests. The city of Lake-town becomes full of life and intrigue, etc. Although all of this cannot necessarily be found on Tolkien’s written page I felt it was there unspoken, ready to be uncovered by a smart filmmaker like Peter Jackson. Nothing in this movie deviates from the messages of the book. It is visually enhanced and storywise expanded, but here at the end of all things, it is still Bilbo’s story and the dwarves quest we’re witnessing, so nothing is lost. Sometimes in order to honor a work of art, you need to absorb it completely as your own. As was the case in Film 1, the acting throughout is nothing short of stellar. The returning cast has complete control of their characters, adding nuances that hint at what each will become by the end of the trilogy. I found Richard Armitage’s Thorin deeply moving, he made me cry when he walked into Erebor again. As for the newcomers, Lee Pace as Thranduil and Luke Evans as Bard stand out. I loved Evangeline Lily’s Tauriel, a fierce warrior with a vulnerable soul. And of course the star of the movie, Smaug, does not disappoint at all. Not only is he superbly voiced by Benedict Cumberbatch but is spectacularly designed by the filmmakers. 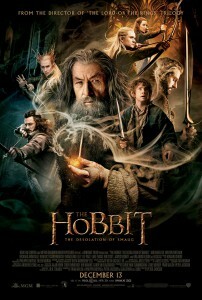 To conclude, I really loved this movie, it increased my admiration for Peter Jackson and his team. While some liberties have been taken with the source material, they were all taken with respect and admiration with the purpose of enhancing the moviegoing experience. I truly enjoyed this movie more than the first one, and in many respects, even more than the book.